I have been using Pinnacle’s Studio HD exclusively to edit HD Video captured by the Canon 7D. It is fairly easy and intuitive. Pinnacle offers several free video tutorials on their site. They even offer an in-depth video tutorials as a download (or DVD) from their site. One of the biggest complaints of Canon 5D Mark II users has been the need to convert video before importing it into Premiere Pro, Vegas Pro and Final Cut. Many also use smaller proxy files to speed up editing. Well, Pinnacle Studio HD costs about a third of these products (approx. $100) and imports Canon 5D Mark II and Canon 7D HD Video directly. No conversions, no proxy files! It is best to be organized when you are working with many elements. I start with everything organized by day. In Studio HD, I navigate to the folder and select the needed files by checking the files to be imported. Studio HD has three buttons at the top left corner: 1. Import, 2. Edit and 3. Make Movie. After importing objects, you can click the Edit button to see the main window. 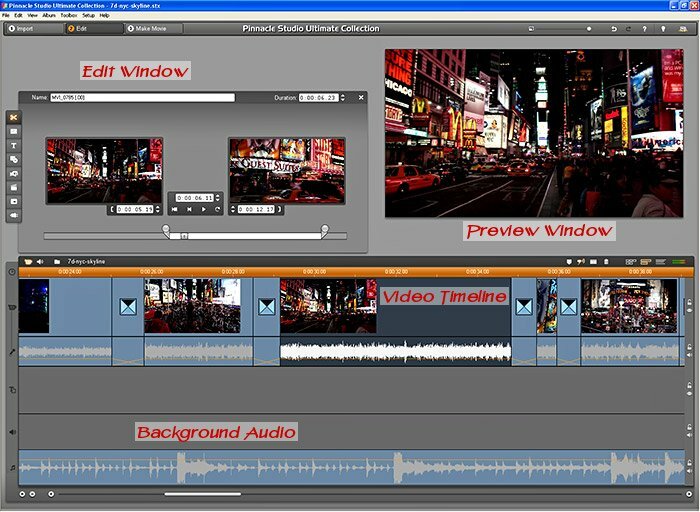 It contains your Video Timeline with layers of audio, the main Edit Window and the Preview Window. Your imported objects are visible above the Timeline (when the Edit Window is not in use). You can preview the clips or just drag and drop them onto the Timeline. After you drag a clip to the Timeline, you can double-click on it to load it into the Edit Window. The video clip has a circle Start Point and circle Stop Point with the video head Cursor in between. Just drag the Start Point to where you want to begin the clip and drag the the End Point to where you want to end the clip. This is non-destructive and can be re-edited at any time. As you edit the clip, you will see it update in the Timeline. Click the X in the upper right to close this window. Want to add more clips? Just drag and drop and repeat the edit process. Simple! With the edited video clip in place, you can now add Transitions before each clip by dragging and dropping them. Click the Lightning Bolt in the main Toolbar to reveal the above transitions. Although there are many transitions available, I recommend that you stick with either the Dissolve Transition or the Fade In/Out Transition since they are more “professional” looking than the other Powerpoint-like Transitions. In each Audio Track, the organge line represents the volume of that track. You can also reduce the volume by clicking on the orange line and dragging it down. This will be very important if you plan to add a background audio track. The more important audio track (either the embedded audio or the background audio) should be higher with the less important audio track lower. You can even completely Mute the track by clicking the Speaker icon at the end of the track. With all the edits in place, it is time to generate the final movie. If you are planning to upload the final movie as HD Video to YouTube, use the above settings. The most effect videos on YouTube are 2-minutes or less and under 500megs. Anything over that limit can be a nightmare to upload to YouTube! I am very impressed with the results from Pinnacle Studio HD. At under $100, it is an economical solution to produce professional results. Next → Next post: Canon 7D Tips: Problem focusing? Customize the AF! Is there any way to save the videos in full 1080p resolution (24 frames/second)? It looks like the setting you have chosen is for 1080i resolution. Also, how do you get the 1080p / 720p pop up menu for your YouTube videos? I uploaded a 1080p video to my Youtube account and it only has the HD button, no pop up menu for 1080p. Both of your questions are tied together. 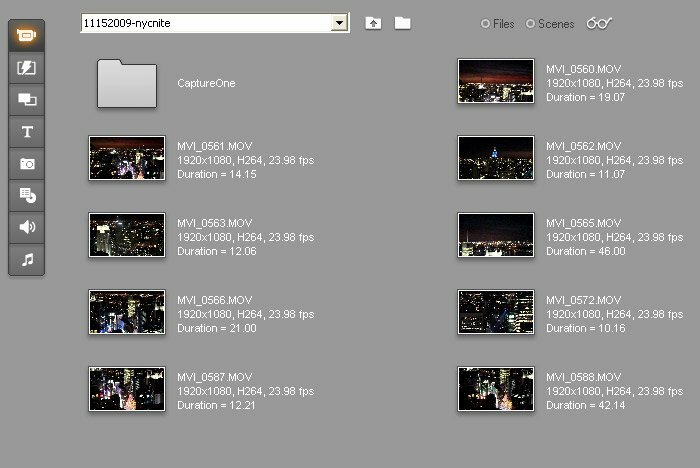 Yes, you can create 1080p in Studio HD. However, when I uploaded it to YouTube it did not generate the HD flag. Since then, I have been using the 1080i setting to generate videos for YouTube and Vimeo. It may be different now that YouTube actually released their 1080p viewing capability. As for getting the 1080p pop-up, my article here explains it. Thank you for the response. I am unable to find any setting to save in 1080p at 24 frames/second. The only 1080p settings appear to be at 30 frames/second. I did try saving a movie exactly as you described in this blog post (MPEG-2 1080/24p) and uploaded it to YouTube. Even when viewed on the the video’s Watch Page there is no menu for 1080p or 720p, only the HD button. Any suggestions? I can’t find your e-mail address, but feel free to send me an e-mail response if convenient. It would be easier for me to see and respond. Thanks! YouTube needs to process the file for HD. It can take 12-24 hours for it to appear depending on their queue. Just don’t try to upload it again or you jump to the end of the queue. You can always reach me through Twitter. I will be getting my 7D soon and i am new to photo/video editing.what setting on the camera is the easiest to edit. is it 1080p 24. It depends on the software used. Pinnacle Studio HD works well with all of the Canon 7D’s video modes. 1080p @ 24fps is not a problem for it. Other software like Final Cut Studio and Premiere work better when the 7D’s video is converted first using Cineform’s Neoscene. I have additional info in my article Canon 7D / 5D Mark II Tips – HD video editing the easy way. 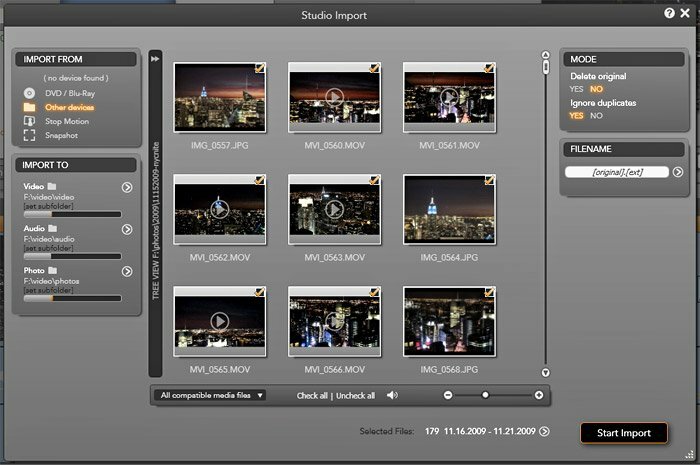 What version of Studio Hd are you using? Pinnacle’s Studio HD is actually version 14. I am using the Ultimate Collection, but just the Ultimate version is great because it includes the extra plugins. All versions of Pinnacle Studio HD (version 14) will import and output video using the native formats of the Canon 7D/5D Mark II/T2i. The big difference with the versions is the extras. 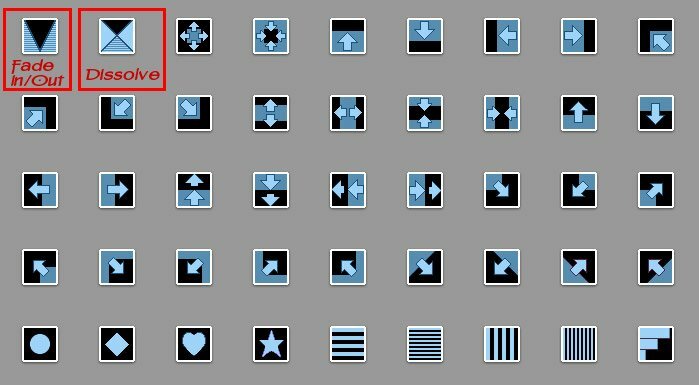 For the money, both the Ultimate version and the Ultimate Collection are both better values because of the added plugins and filters. Can this program also edit pictures ?? No, it just edits video and provides a library organizer. The new version is Pinnacle Studio 16 which I have not used.